In tonight’s episode, we had a number of people step up and become who they were meant to be. 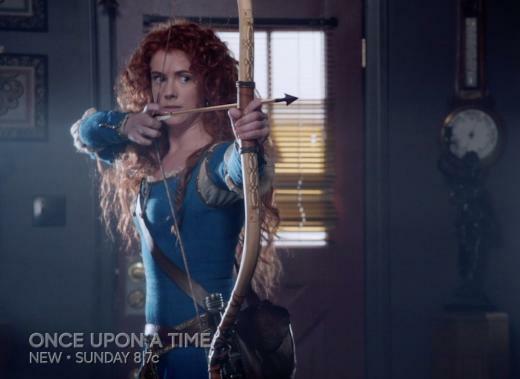 Merida learns that her skills with a bow and the lesson her father taught her are enough to be able to rule her kingdom. Rumple learned what it truly means to be a hero. Both of them learned their lesson with Belle’s help, she became their guide which is becoming her main role for characters in this show. At the beginning of the episode, the group breaks into the dungeons and rescue Lancelot and Merida. As they are walking through the forest Merida knocks out Belle, because she needs Belle’s skills with magic. Merida is determined to rescue her brothers and she firmly believes that she needs magic to accomplish that task. Merida tells Belle that the clans lost faith in her during the last battle they had against an outside force. During the battle, Merida had the chance to save her father from an attack but her arrow missed. To this day, she blames herself and so do the clans. She has lost all faith in her abilities. She does not believe her skills with a bow are enough to rule the kingdom. She feels inferior to the men she is supposed to rule. Belle listens to Merida’s story and she hears her. She understands the way Merida feels, but she tells Merida that she can;t continue to blame herself. She has to put that aside and see herself as a great queen. She has to have confidence in her abilities to rule or no one will ever follow her. Through a little trickery Belle proves her point and Merida sees what she can do and realizes that she already has all she needs to be a good ruler. Belle has always been one of my favorite Disney princesses. She is a bookworm, which obviously instantly appealed to me. She also always sees past the surface level of a person. Instead of taking them at their word and she sees deeper. She sees that Merida can be a great ruler and she sees that Rumple can be a hero. She will not let people pretend to be someone other than who they truly are. 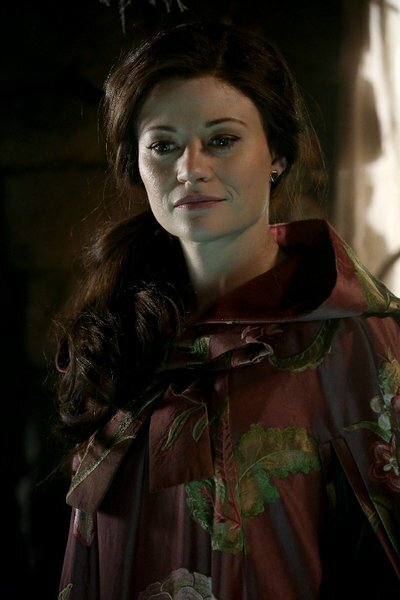 I love that Belle always sees the true person. This is proved more than ever in this episode. When Rumple realizes that he is supposed to fight Merida to save Belle he freaks out. He tries to run. Belle is not going to go with him. She gets out of the car and tells him off. She is not okay with him running. She understands his fright. She understands that he has trouble forgetting the man he once was. But she knows there is more to him. She knows that he has the ability to stand up and save her. Running is that way. She will not stand by and watch him run away. She turns away and heads back to Storybrooke. Belle is not one to give up. There is always a solution and she will find it. In the end, Rumple does set up and save Belle. He finally is able to see himself as Belle sees him. He finally understands what she has been telling him for so long. He becomes a hero. I thought this transformation would take much longer, but it was done well in this episode. Because he is now considered a hero he pulls Excalibur from the stone for Emma. Emma is satisfied and gives Merida back her heart. While Rumple hands over the sword he also hands her a threat. He is now a hero and she is a villain, their roles have reversed. Rumple will not allow Emma to destroy the new life he has gained. The others are out to save Emma, Rumple is now out to stop her. “Even will all the time in the world some things can’t be forgotten.”- Zelena- She tells this to Emma. Henry is not going to forget what she did easily. Even after she loses the darkness there is still going to be many consequences waiting for her to deal with. Zelena points out that she is alright being alone and hated, something Emma will never be alright with. “If you remember what you fight for you’ll never miss your target,”- Merida- Our group has to remember who they are fighting for. Emma is still inside of The Dark Swan, they just have to pull her out. Where is Merlin in the present? Did Emma get to him? Why would she go after him? Can he stop her somehow? How is the sword reforged? What happens when the sword and dagger are rejoined? Does it all depend on who uses it? Is she the love of Merlin’s that he was crying over before he became a tree? Is she somehow more powerful that Merlin? What is this new Rumple going to be like? Will he help save Emma or is he going to try to destroy her? How is Arthur gong to play a part in all of this? Posted on November 3, 2015, in Once Upon a Time, Tv Shows and tagged Bear and Bow, Belle, fairytales, fiction, Merida, Once Upon a time, Rumple, tv show review. Bookmark the permalink. Leave a comment.